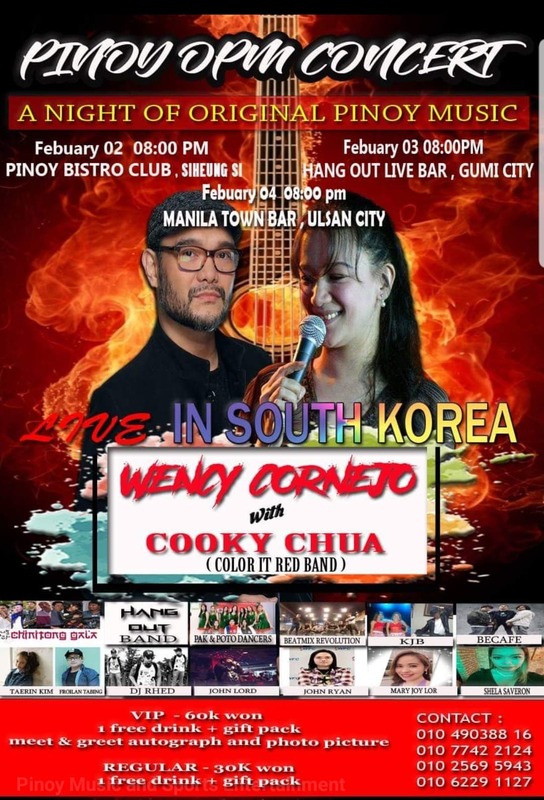 SEOUL - The month of love comes a night of Original Pinoy Music as Wency Cornejo and Cooky Chua goes live in South Korea in "Pinoy OPM Concert Tour". Reminisce classic OPM songs like "Hanggang" and "Paglisan" on Pinoy Bistro Club, Siheung City on February 2, 2019, Hang out Live Bar, Gumi City on February 3, 2019 and February 4, 2019 at Manila Town Bar, Ulsan City together with Filipino artists based in Korea. Catch the special performances from Chinitong Gala, Hangout Band, Pearl of the Orient, Beatmix Revolution, KJB, Becafe, Tarin Kim, Froilan Tabing, DJ Rhed, John Lord, John Ryan, Mary Joy Lor, Shiela Savaron and many more. This event is supported by Pinoy Artists in Korea and Pro Biscano Organization. For tickets and sponsorship inquiries, contact Rich Acasio on Facebook messenger.